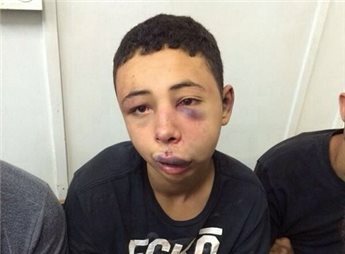 The brutal beating of a 15-year-old Palestinian-American boy by Israeli forces in Jerusalem is proving to be a landmark moment in coverage of the conflict, as American media are reporting Tarek Abu Khdeir’s story in a straightforward manner for once. Their sympathetic reports are bringing the Palestinian experience back here as never before. Then there’s the Washington Post. The Washington Post has up a video interview of the youth, in which he says that he was just watching protests of his cousin’s murder when police attacked him. Tarek Abu Khdeir says he did not throw rocks. I was standing there watching what was happening… I tried to jump the fence, and I fell after I jumped the fence… I don’t know why they came running at me, but right after they came running at me, I ran… I don’t know why they hit me that hard. I fell asleep from how hard they hit me. I went unconscious. I’m angry, I’m disturbed. I’m ready to take legal action. Because this happens to Palestinians every single day… [Because he’s an American] He got the opportunity for all the media and for the whole world to hear him. For once. But other Palestinians that live here, this happens all the time, they never have the opportunity to voice, to talk about it, to show. She says that one man from the US consulate has been with the family from day 1. My message is that I’m sorry you don’t show that you have feelings. You do not have hearts. This is a child. He’s 15, and to beat him up this badly, you have no personal issues with him. No one should be beat up this badly. No one. For any reason… This is not human. Ayman Mohyeldin of NBC posted this video of Abu Khdeir being released to house arrest and had an excellent report on the Nightly News last night. He asked Abu Khdeir what the marks were on his wrists and the boy said: “This is from the handcuffs when they took me to jail.” He also showed video of marks on the youth’s back, from “stomping,” Abu Khdeir said. After actually coming and going through it, I don’t blame these people for hating, for having so much hate for Israel.